Construction: Our AC & DC Portable type Ammeter & Voltmeter are manufactured by the best quality material to give satisfactory performance over a long period. The moment is fitted on the bakelite panel. The moment is secured between two saffire jewels. The precisely ground pivots are been used for minimizing the friction and sustain accuracy in vigorous field condition. The effective oil damping provides uniformly control torque and brings the indicating pointer to its final deflecting position without much oscillation. All the metal parts are adequately plated to suit the tropical condition. Instruments are effectively shielded from external magnetic effects and electrostatic influences. All the instruments have zero setting devices in the front except power factor meters. Application: ME Portable Meters are used for the measurements of the electrical quantities like current, voltage, Power (Active , Reactive) or the power factor of the network. Scale Length 145 mm Approx. 145 mm Approx. 145 mm Approx. Damping Test : Less than 4 seconds for the pointer to come to within 1.5% of its steady state value when a current corresponding to 2/3 of the full scale value is applied. Center Zero or shifted zero instrument are available in moving coil and dynamo type meters. 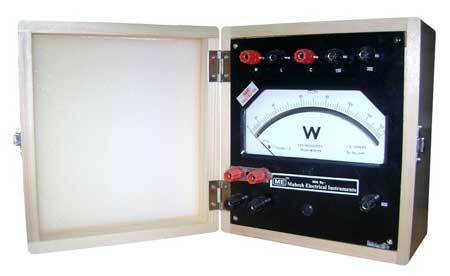 Multi range voltmeters, ammeters and watt meters are available. Precision grade instruments are available with accuracy 0.5%.